If you are learning how to make a chili con carne recipe, this is Spanish for “chili with meat”. 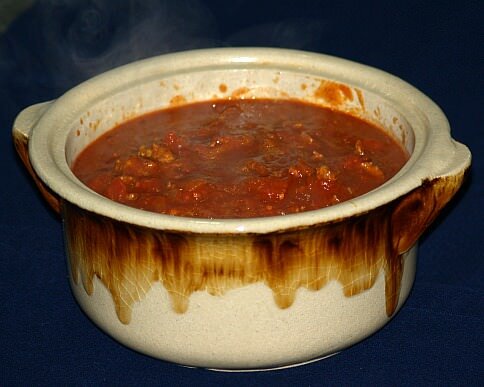 This is any chili recipe containing meat and whatever other ingredients you may wish to use. Most of the time chili peppers are an important ingredient for this chili. Although some of us wanted to attribute the chili recipes to the Spanish countries, none of them want to claim the fame according to the history of chili. It seems it belongs to the area of the United States close to the southern Texas border. Chili began as a way to prepare a lot of food at a very cheap cost without the addition of meat or with very little. By adding beans it was very filling but very low in cost. Adding meat to make a chili con carne recipe was a luxury although today we still think of it as an economical dish to prepare. Since I learned how to make a chili con carne recipe, in the winter time there is nothing better than a big pot full. The wonderful flavor of meat, onions, garlic, tomatoes, hot peppers and yes, even beans makes my mouth water. I know a lot of people don’t like the beans in their chili but I like it all ways. If you are learning how to make a chili con carne recipe, today we have many variations using many different ingredients. It can be make with ground beef, beef chunks, beef steak, ground chicken, chunks of chicken, sausage, other pork cuts and even venison. The other possible ingredients are just too numerous to mention. If you eat a chili con carne recipe made by many different people, there probably will not be two that taste the same. Throughout the years, I have heard stories of venders, parlors or restaurants that solely run their businesses from the profits of making chili or a chili con carne recipe; that is how popular these recipes are. This is why the chili cook offs became so famous all over the country. The levels of spiciness can vary to all degrees; some of the most popular being very hot. The condiments with which this dish is served also varies immensely from cheese, sour cream, fresh onions and cooked rice. However it is served it is usually very flavorful and delicious. You can never go wrong by serving any of the chili recipes with a warm cornbread recipe. Heat oil in a heavy large saucepan. Cook beef, onion and green pepper over medium heat until meat is done. Drain the kidney beans and corn and add to the meat mixture. Next add the tomato sauce, tomatoes, green chilies, chili powder, garlic powder, salt and pepper. Stir mixture to blend well. Put mixture in baking pan or dish. Set pan on a tray in the oven and bake for 45 minutes. Serve with your favorite cornbread and grated cheese. Heat oil in a heavy cooking pan. Cook pork until brown on all sides. Add the garlic, cumin and chili powder. Stir in the soup, beef broth, tomatoes and beans. Season with salt and pepper. Heat mixture to a boil, cover with a lid, reduce temperature to low and simmer for 35 minutes. Serve over the rice. Can garnish with sour cream and sliced green onions. Brown venison and beef in a large pot over medium heat stirring constantly. Add onion and garlic; continue stirring and cooking for 5 minutes. Add remaining ingredients stirring after each addition. Reduce heat to a simmer and cook slowly for 2 hours stirring occasionally. NOTE: Watch that it doesn’t get too dry and stick. Sauté onion and garlic in butter until tender. Add beef; cook and stir until beef is brown. Add remaining ingredients and bring to a boil; reduce heat, cover and simmer for 30 to 40 minutes. 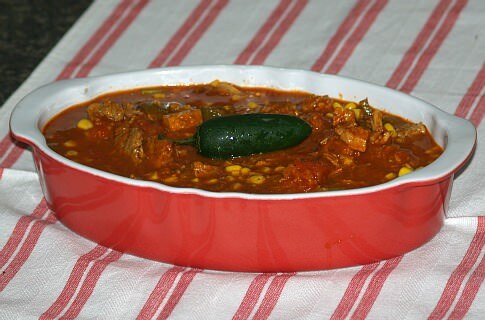 Learn how to make this hot chunky chili recipe. WHAT IS PURE CHILI POWDER? Chili powder which you purchase usually contains cumin, oregano and/or other spices. PURE chili powder is only ground powder from chili pepper pods. DIRECTIONS: Sauté suet until browned and cured in a large pot. Add steak and garlic; stir until meat is browned on all sides. Add remaining ingredients and bring to a boil; cover and simmer 1 hour. Remove cover and simmer 30 minutes or until chili thickens. Serves 16. Brown ground beef and onion together in a large pot. Cook spaghetti in 3 quarts of salted water; reserve water for chili. Add remaining ingredients EXCEPT WINE to pot with beef; simmer for 1 ½ hours. Add red wine to pot 30 minutes before finish cooking; stir in cooked spaghetti and serve.